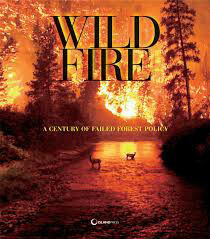 live with wildfire is ultimately our wisest public policy. have hindered natural processes, creating a tinderbox of problems that we are faced with today. "The history of fighting fires, the authors argue convincingly, has been self-defeating and based on unscientific assumptions about the role of fire in the contintent's ecology...Equally convincing, perhaps, are the photographs on display in this volume." "Reader advisory: This hefty, beautifully illustrated book — about as wide as a 25-year-old Doug fir stump — is likely to piss off the following: timber companies, loggers, Forest Service firefighters, the Oregon Board of Forestry, OSU College of Forestry administrators, herbicide companies, Columbia Helicopters and everyone else invested in the Old Forestry view that people should 'manage' nature's wild forces in order to serve humanity's material needs. In that line of thinking, wildfire is bad; it steals valuable timber that could have been logged and converted into useful things like paper and houses. Thus the development of a 'fire-military-industrial' complex linking the Forest Service to industry and siphoning billions of tax dollars to fight fires on public lands. Today, ecologists recognize that fire suppression does incalculable damage to forests that have evolved with wildfire, hijacking their natural processes and helping turn them, slowly but surely, into tree farms. Which, not incidentally, is convenient for timber companies hankering to log in public forests, and for land grant universities such as OSU that get a cut of the timber revenue. In Wildfire, a project of the Foundation for Deep Ecology, more than 25 fire ecology experts — including Eugene's Timothy Ingalsbee — propose that wildfires are good, and that people's attempts to control them ultimately backfire. "While this book is about fire policy and fire ecology, it is also a discussion of a much larger philosophical debate over the ultimate role and influence humans should have on natural landscapes," editor George Wuerthner states in the introduction. EW was privy to an email string between Big Timber allies reacting to this book. 'Makes a feller retch,' former OSU forestry professor Mike Newton wrote. 'These guys have money,' replied Bob Zybach of Oregon Websites and Watersheds, a timber think tank of sorts. 'I plan to finger and smudge a copy in the bookstore, and then not buy it,' added Lebanon tree farmer Mike Dubrasich, who administers the right-wing forestry blog SOSForests.com. Their reactions only confirm the deep schism in forestry circles over how to handle wildfire. Those who subscribe to the old utilitarian view are sure to hate Wildfire; those who are deep ecologists, or open to their ideas, are likely to find it a valuable reference. The photos are gorgeous, the writing passionate and the mission clear: Fire Smokey the Bear, and let the forests burn, baby." "This aesthetically pleasing, well-written, and overall outstanding book is highly recommended for all collections." "The book is a magnificent and magisterial production...Could it be an intellectual foundation for a future national wildfire institute—in Los Alamos?" "There's nothing to compare to it, making it a recommended resource."